The Entomology Department is involved in research on insect mite and nematode pests of sugar cane and potato. Studies are conducted on the biology of these pests and their natural enemies including predators, parasitoids and pathogens. The main objective is to apply pest management strategies that would minimise the use of chemical pesticides. Research is being conducted towards the establishment of an Integrated Pest Management strategy i.e. use of multiple pest control tactics in an economically and ecologically sound manner so as to maintain the pest populations below economic injury levels and at the same time minimise hazards to human beings, animals, plants and the environment. The department is also involved, together with the Ministry of Agriculture and Authorities in Réunion Island, in deciding upon quarantine measures to minimise the risk of entry of the sugar cane white grub Hoplochelus marginalis into Mauritius. 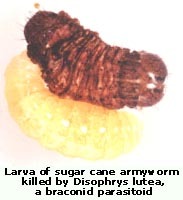 This grub is causing severe damage to sugar cane and other crops in Réunion Island. A reference collection of authoritatively identified Mascarene insects is being build up in the Department. Holdings to date comprise some 535 identified species and more than 8000 specimens. 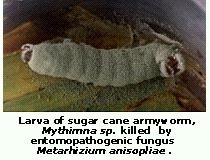 The main pests of sugar cane are the spotted borer, Chilo sacchariphagus, the scale insects, Aulacaspis tegalensis and Pulvinaria iceryi, the armyworms, Mythimna spp.and the white grubs, Heteronychus licas and Phyllophaga smithi. Studies are being carried out on the biology and bionomics of these pests to improve upon the biological control. The role of entomopathogens as a natural mortality factor of these pests and the effect of host plant characteristics are being studied. The Department is fully involved, together with the Ministry of Agriculture and the Authorities in Réunion Island, in deciding on quarantine measures to minimize risk of entry into Mauritius of the white grub, Hoplochelus marginalis,which is causing severe damage to sugar cane and other crops in Réunion Island. Leaf miners, Liriomyza spp. and Thrips palmi are the main pests on potato. 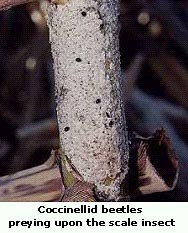 An IPM strategy for the control of the leaf miners is recommended. This involves minimal use of broad-spectrum insecticides and timely application of insect growth regulators so as to allow proper development of parasitoids. Yellow sticky traps can be used to monitor the population or for mass trapping of flies.